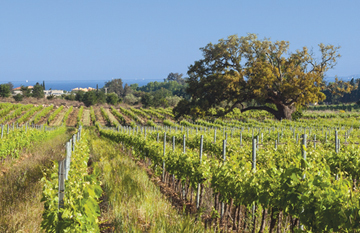 Located less than 4 km from Camping De La Pascalinette®, Château des Bormettes is a beautiful vineyard forming part of La-Londe-les-Maures’ reputed wine growing area. The Château des Bormettes vineyard is planted with 173 acres of vines set on hillsides facing the Mediterranean Sea and beautiful Golden Islands. The vineyard pans out around Pic Saint-Martin (altitude 111 m) and features magnificent veteran cork oaks. The cellar is set under an ancient Carthusian monastery (Chartreuse de La Verne), nestling in 346 acres of forests. The site is very reminiscent of the exceptional vegetation found at Camping de la Pascalinette®. Vines have been planted on the Château des Bormettes terroir since Roman times, but it was the monks who developed the vineyard from the 14th century onwards. The estate is closely tied to Camping de La Pascalinette as it was bought up by Victor Roux – a direct ancestor of the campsite’s owner. Château des Bormettes produces red, white and rosé wines in the capable hands of a passionate team of experts, ranked among the “Top 10 Wine Growers of the Year” in 2016. And to top it all, you’ll be delighted to learn that you can taste these delicious local wines free of charge! If you would like a guided tour, please book at the Tourist Office. After your picturesque tour and tasting session, simply head back to the campsite to relax at our water park.